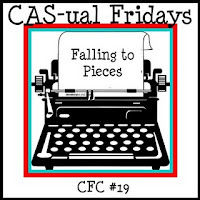 In an effort to combine challenges (because I'm the s-l-o-w-e-s-t card maker out there), I worked on a card this weekend that combined Waltzingmouse Sketch Challenge #64 and CAS-ual Friday's Challenge #19: Falling to Pieces. This card is not your traditional fallish card, no leaves or pumpkins here. Instead I went with a back to school card for my twin boys (see those two mischievous boys in the middle of the bus?). I even included some of their buddies! I customized some of the Waltzingmouse stamps with glasses and longer hair, but wouldn't it be awesome if WMS had an add-on stamp set with girls!?! I started off with a regular card but shaved off about an inch from the front. I used an anywhere square punch for the windows. 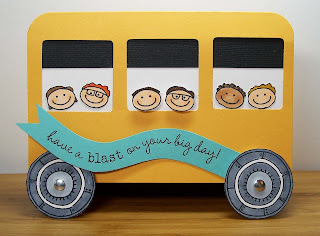 The wheels of the bus (go round and round) are stamped from two window stamps from the Half Pint Heroes set. Don't they make cute wheels? Lastly, I added a curved banner flapping in the wind! Thought that sentiment was perfect for the first day of school. Lots of fun to make for my best boys! Thanks for looking! Oh my gosh!!! This is so fun!! I love it!! This is the CUTEST!!!!!!!!!! I've always wanted to make a schoolbus card just like this! Love the cute little faces! OK, this is just so AWESOME! The wheels, the awesome wavy banner, the ca-yute little kids...omg, just adorable. I love it!!! This is just the most adorable card. 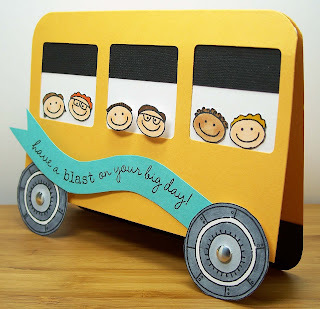 Such great creativity, and those little Half Pint Heros look fantastic in your sweet school bus. 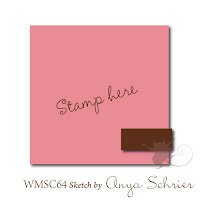 I LOVE this and how great it works with the Waltzingmouse Stamps Sketch Challenge. Well done! Just the best!!! I do like the way you've customised the characters (and I agree a girly set would be fab). Love this card! This is fabulous! What a clever idea. Those face just crack me up! So glad you joined us for CAS-ual Fridays! Oh this is so cute!! I love the popped up heads! Adorable! Thanks for playing along at CAS-ual Fridays! Is this ever creative and adorable!! I actually thought the tires are from tire stamps!! You have very creative ways of using the stamps!AWESOME job you did! Love the mischievous-looking boys of yours! Thanks so much for playing with us at CAS-ual Fridays! Oh! this is just SO cute! what a creative design! love it! Thanks for playing with the WMS sketch this week! Love this sweet creation! All those happy little faces on the school bus, so cute!! Oh this is a precious, precious card! 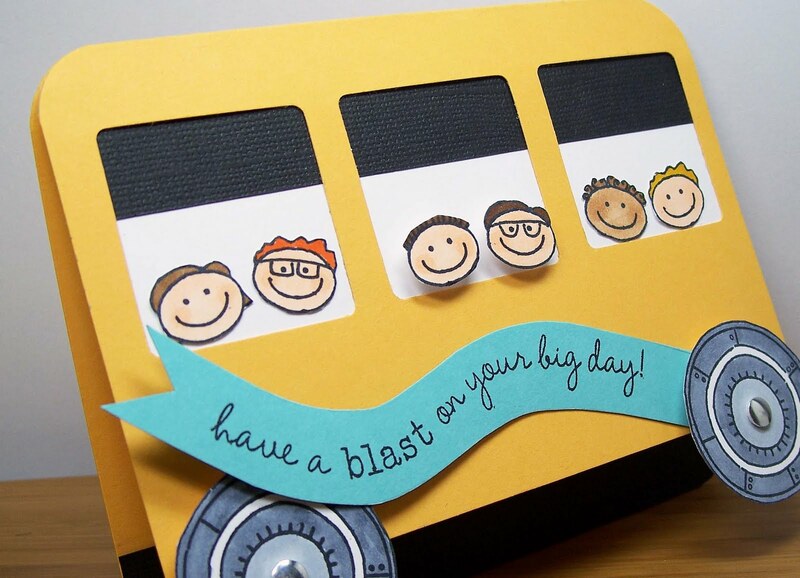 I just love the way you turned that sketch into a bus with the sweet banner! Adorable use of Half-Pint Heroes! LOVE IT~! Wow, SO ADORABLE! What a clever approach to the WM sketch. Love the sweet faces and that banner is the perfect place for your sentiment. Thanks so much for visiting my blog. Well deserved congratulations to a Top Mouse - brilliant card!! What a fun card!!! So cute!! I know my girl would love it!! Congrats on beign a Top MOuse; so well deserved. This is stunning!!! Wow! Design and color combination is spot on i want to see more of these cards. I absolutely love this card and am lifting it TODAY. I will definitely give you credit and a link back to your blog. Thanks for the inspiration!